As its basic policy on corporate governance structure, AGC clearly separates the functions of "oversight" and "execution" of management, aiming to reinforce the management oversight function while ensuring quick decision-making in management execution. The management oversight function is mainly shouldered by the Board of Directors, which is a "body that approves basic policies and oversees the management of AGC." We have enhanced the objectivity and transparency of management and strengthened our corporate governance system by appointing 3 Outside Directors, out of 7 Directors in total. Aiming to further strengthen the management oversight function, AGC Inc. established the Nominating Committee and the Compensation Committee, as voluntary advisory committees of the Board of Directors. 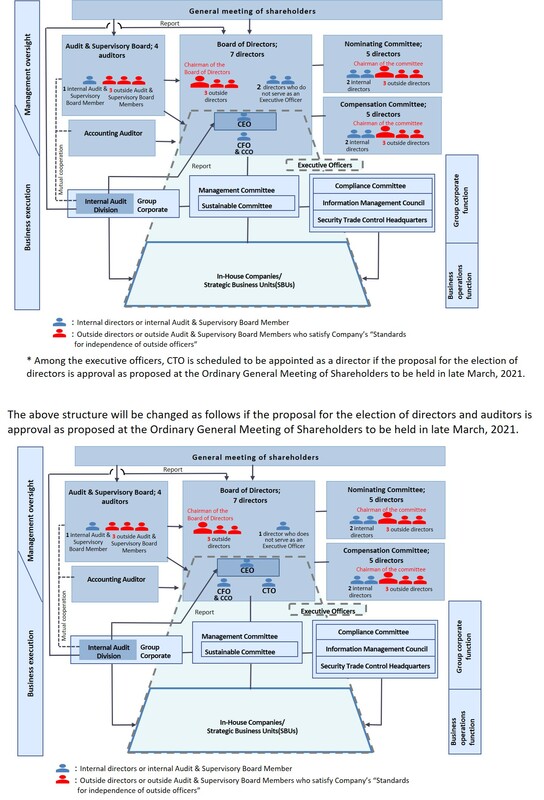 The majority of members of both committees are Outside Directors. The Company also adopts the Audit & Supervisory Board Member system, and the Audit & Supervisory Board consists of 4 Audit & Supervisory Board Members, including 3 Outside Audit & Supervisory Board Members. The management execution function is assumed by the President & CEO and the other Executive Officers. The Company also established the Management Committee as an advisory committee for the President & CEO, and it deliberates on decision making for the Group's management and oversees the business management. With regard to the execution of business operations, the AGC Group introduced the In-House Company system; adopted a globally integrated management system; and transferred significant responsibility and authority for the execution of business operations to each In-House Company and SBU. 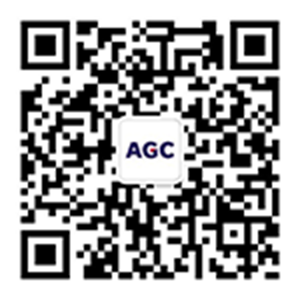 The Company has formulated the AGC Group Corporate Governance Basic Policy (the "Basic Policy") to further enhance the Company's corporate governance with the aim of achieving both sustainable growth and mid- to long-term enhancement of corporate value. Its full text is available below. AGC Inc. cannot have more than 15 Directors, with the Board of Directors currently consisting of 7 Directors including 3 Outside Directors. To ensure the independence of Outside Directors, the Company elects Outside Directors while using as "the standards for independence of Outside Director / Audit & Supervisory Board Members" for such election the provisions concerning Outside Directors of the Companies Act and in-house regulations. Although there are business relations between the Company and companies to which Outside Directors belong, prices and other transaction terms are determined in the same way as for arm's length general transactions. In principle, the Board of Directors shall be chaired by an Outside Director. Directors are elected at a General Meeting of Shareholders. To elect Directors, the presence of shareholders owning not less than one-third of the votes of all the shareholders of the Company who are able to exercise voting rights is required, and no cumulative voting is used for that purpose. The term of office of Directors is 1 year. In fiscal 2018, the Company held 14 meetings of the Board of Directors. Directors' compensation discloses the respective total amounts of Monthly Compensation, Bonuses, and Stock Compensation in the Business Report. The compensation system consists of "Monthly Compensation" as a fixed compensation, and variable compensation in the form of "Bonuses" and "Stock Compensation". For Directors who also serve as Executive Officers, and for Executive Officers, compensation consists of three components for Monthly Compensation, Bonuses, and Stock Compensation; for Directors not serving as Executive Officers (including Outside Directors), compensation consists of Monthly Compensation and Stock Compensation. Corporate Auditors are paid only Monthly Compensation. The Company does not adopt a retirement benefit system for Directors. The Nominating Committee consists of up to 5 Directors, with at least half being Outside Directors. At the moment, the committee is composed of 5 Directors, including 3 Outside Directors. The Nominating Committee shall be chaired by an Outside Director. The Nominating Committee held 13 meetings in fiscal 2018. The Compensation Committee consists of up to 5 Directors, with at least half being Outside Directors. Currently, the committee is composed of 5 Directors, including 3 Outside Directors. The Compensation Committee shall be chaired by an Outside Director. The Compensation Committee held 8 meetings in fiscal 2018. The Company cannot have more than 5 Audit & Supervisory Board Members, with the Audit & Supervisory Board currently consisting of 4 Audit & Supervisory Board Members, including 3 Outside Audit & Supervisory Board Members. Audit & Supervisory Board Members are elected at a General Meeting of Shareholders. To elect Audit & Supervisory Board Members, the presence of shareholders owning not less than one-third of the votes of all the shareholders of the Company who are able to exercise voting rights is required. Audit & Supervisory Board elects full-time Audit & Supervisory Board Members by its resolution. Currently, the Company has 2 full-time Audit & Supervisory Board Members. The term of office of Audit & Supervisory Board Members is 4 years. The Audit & Supervisory Board Secretariat has been established to assist Audit & Supervisory Board Members in their duties. Any transfer or evaluation of staff of the Audit & Supervisory Board Secretariat requires the approval of the Audit & Supervisory Board. The Audit & Supervisory Board held 14 meetings in fiscal 2018. Compensation for Audit & Supervisory Board Members is paid only on a monthly basis, and its total monthly amount is disclosed in the Business Report. The Company has no personal, capital or business relationships or other conflicts of interest with Outside Audit & Supervisory Board Members. Accounting Auditor is elected at a General Meeting of Shareholders. The Company's current Accounting Auditor is KPMG AZSA LLC. In fiscal 2018, the Company and its domestic consolidated subsidiaries paid 153 million yen to the Accounting Auditor KPMG AZSA LLC. as compensation for the service stipulated in Article 2, Paragraph 1 of the Certified Public Accountants Law (Law No. 103, 1948). In addition, the Company paid 15 million yen to an Accounting Auditor for completing the agreed duties. Amounts less than 1 million yen discarded when they are indicated by the unit of a million yen.